• Business continuity is embedded and sustained as a core business practice. • Crisis management and recovery plans are integral to doing business at Intel. • Every Intel business group is required to have an active business continuity plan for their core business functions and processes. • Business continuity plans are tested regularly as a continuous improvement process. • Employees are trained on plan response. • Regular assessments are required for response and recovery plans. • New and emerging risks are integrated as part of sustaining program. • Deploying redundant processing capacity at other locations. • Developing procedures and systems designed to support recovery processes for critical business functions. • Activating business continuity and technology teams tasked with managing the recovery process. • Maintaining communications to ensure that Intel employees receive emergency notifications and instructions via a variety of sources, including in-building announcements, internal and external websites, and toll-free telephone numbers around the world. • Testing our emergency and recovery procedures on a regular basis. • Conducting annual assessments of each Intel organization’s business continuity program. 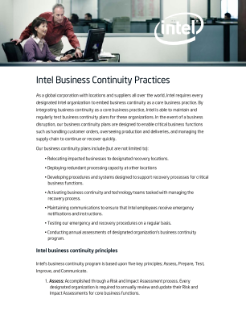 Read the full Business Continuity Practices Paper.